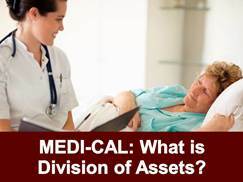 Division of Assets is the name commonly used for the Spousal Impoverishment provisions of the Medicare Catastrophic Act of 1988. It applies only to married couples. 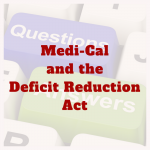 The intent of the law was to change the eligibility requirements for Medi-Cal in situations where one spouse needs nursing home care while the other spouse remains in the community (i.e. at home or in an assisted living facility). The law, in effect, recognizes that it makes little sense to impoverish both spouses when only one needs to qualify for Medi-Cal assistance for nursing home care. As a result of this recognition, division of assets was born. Basically, in a division of assets, the couple gathers all of their non-exempt (countable) assets together in a review. See box to the right for a list of exempt assets. 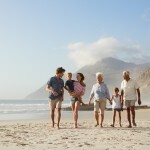 The non-exempt assets are then divided in two, with the community (or at home) spouse allowed to keep one-half of all countable assets up to about $123,600 in 2018. 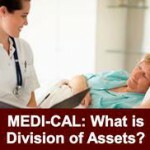 The other half of the countable assets must be “spent down” until $2,000 remains for California residents. Usually this can be done astutely so the assets remain in the family but are no longer considered a countable asset. Each state also establishes a monthly income floor for the at-home spouse. This is called the Minimum Monthly Maintenance Needs Allowance (MMMNA). In California, the community spouse is permitted to keep a minimum monthly income of $3,090 in 2018. If the community spouse does not have at least $3,090 in income, then he or she is allowed to take the income of the nursing home spouse in an amount large enough to reach the MMMNA. The nursing home spouse’s remaining income (minus a personal needs allowance) goes to the nursing home. This helps avoid the necessity for the at-home spouse to dip into savings each month, which would result in gradual impoverishment. The bottom line is that Medi-Cal Planning is complicated and it is essential to seek advice from a legal professional who knows Medi-Cal law. The home, no matter its value. The home must be the principal place of residence. The nursing home resident may be required to show some “intent to return home,” even if this never actually takes place. Cash Value Life Insurance policies as long as the cash surrender value of all policies combined does not exceed $1,500. If they do exceed $1,500 in total cash surrender value, then the cash value in these policies is countable. 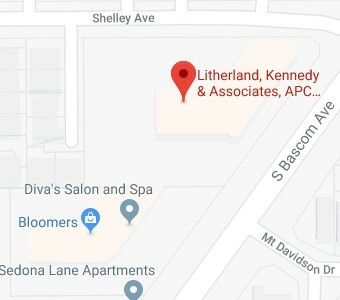 The Litherland, Kennedy & Associates, APC, Attorneys at Law has been providing quality estate planning and elder care services in the Greater Bay Area since 1975. We are members of the American Academy of Estate Planning Attorneys, a national membership organization committed to assisting attorneys in providing quality estate planning services to their clients. We are also members of the National Academy of Elder Law Attorneys, a membership organization comprised of attorneys in the private and public sectors who deal with legal issues affecting the elderly and disabled. Our team of qualified and experienced individuals, many of whom have been with our firm for over 10 years, are trained in the complex areas of estate planning, trusts, probate, Medi-Cal, special needs planning, tax law and geriatric care management. The aim of all members of the law firm is to help you accomplish your estate planning goals and to take the mystery out of the planning process. Our Geriatric Care Manager helps our senior clients and their families with Medicare issues and Medi-Cal applications and representation. She provides psycho-social assessments of health care needs, develops individualized plans for care, evaluates the specific needs of clients, and makes recommendations when applicable for home care services, independent living communities, assisted living facilities, and nursing facilities. Her goal in working with clients is to advocate on behalf of the senior, and to enhance the quality of life of both the older adult and his or her family.